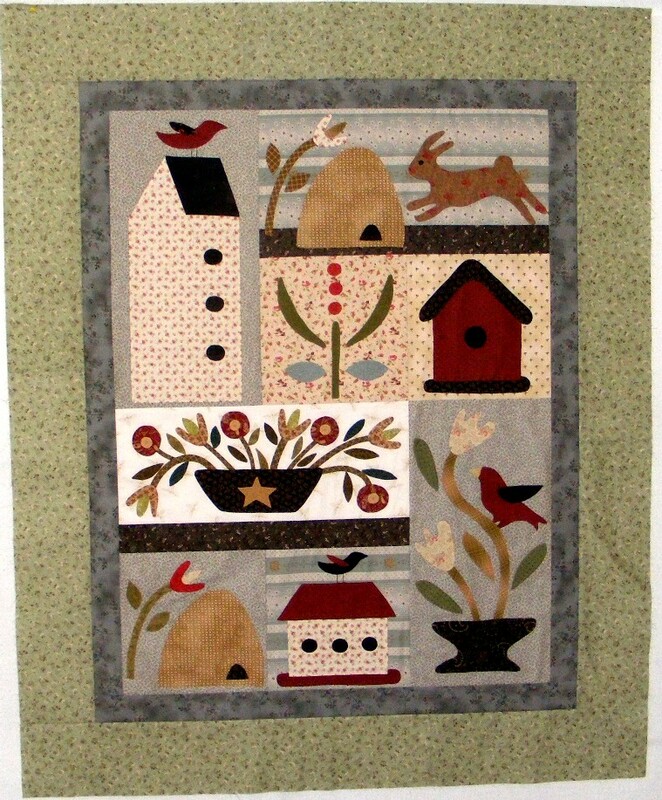 Quilting Adventures: A new Flimsy....! Yeap, I've been a busy bee! I started this hand applique quilt back in July! 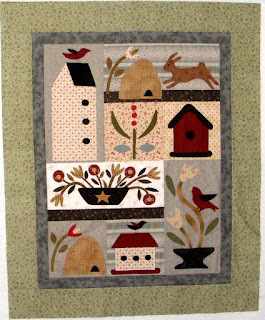 The pattern is called Spring Fling By Jan Patek! Whenever I start a hand project, whether hand applique or embroidery, I always begin with the block that requires the most work. I then work my way down to the simplest block. I really find it easier for me to get motivated to finish the quilt, as the blocks get less and less intense. I also tend to prepare all of the blocks at the same time. When one block is completed, I can quickly pick up another. I'm also a gluer! I'll have all of my pieces glued down. It makes my blocks portable, allowing me to work on them whenever and where ever! I do like the way this quilt turned out. I think I will call it Summer Days 2011. We really did have wonderful weather this summer. The quilt is now awaiting its turn on Penelope. Thank you so much for stopping by! Keep Well! Good job on the wall hanging. I like you method for doing the applique. I have an applique project in process sort of, lol. Finished three of the four easiest blocks - but oh how I wish I had at least one of the harder ones behind me. Wonderful piece, and great fabric choices. I hope you don't get too much of the storm, up your way. Ooh! Ooh! I like this quilt. I am guessing that the pot of flowers was the hardest block to make. You made good fabric choices for the project.